In common with other major oil companies, Esso has generally issued a combined map for Belgium and Luxembourg, although there is a Luxembourg only map shown on the country page. 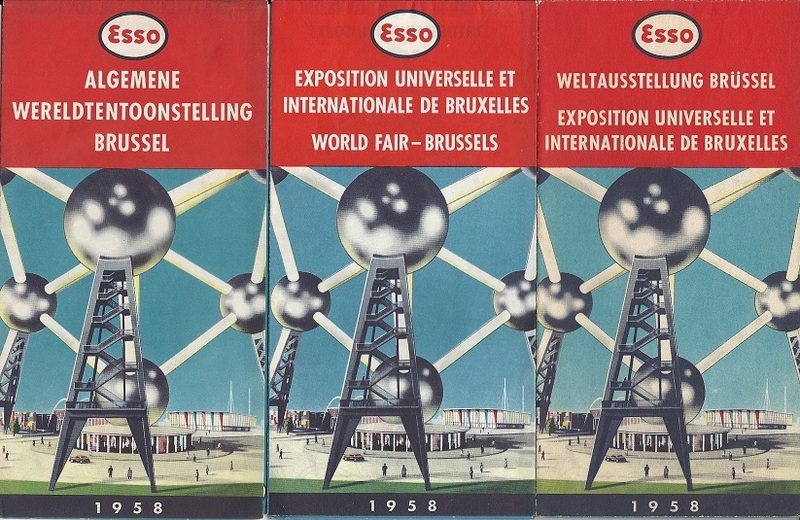 Three basic designs of Esso Belgium maps with photographic covers are known. 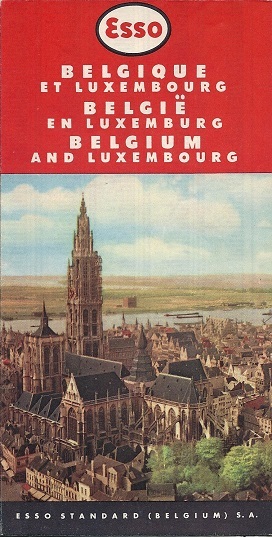 The first featured the Grand Place in Brussels (far left, 1951-4); next came Antwerp (centre left, 1955-7) and finally Dinant on the Meuse (near left, 1958-61). All were slightly smaller in format than most Esso maps. Drawn by General Drafting Company at 1:420,000 (but locally printed) they have four town plans and a pictorial guide on the reverse. 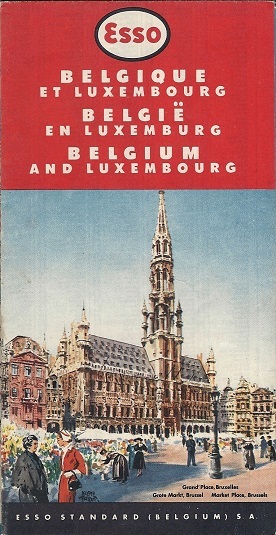 Esso's only map of Brussels was issued in 1958 to help visitors to the World Fair (Exposition Universelle). This is the English & French version (above right) of a map that also appears in a Flemish (Dutch) and a German & French edition; all three are shown on the enlarged image. Netherlands Esso maps often featured quite striking designs. All were produced by Topografische Dienst to designs originated by General Drafting Company at a scale of 1:387,000. No version is known for 1954. 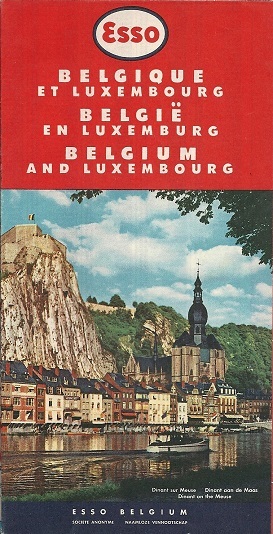 The 1953 map was the first to use the General Drafting Co design; as elsewhere in continental Europe from 1962 onwards (through to the late 1980s) a simple outline of the country was used on the front cover. Unlike (say) Caltex, which issued several Dutch city maps, none are known from Esso. Esso nautical maps are shown on the Esso cruising map page. Stan DeOrsey has helped me to date the 1950s Dutch maps from his work on the General Drafting Co archives. 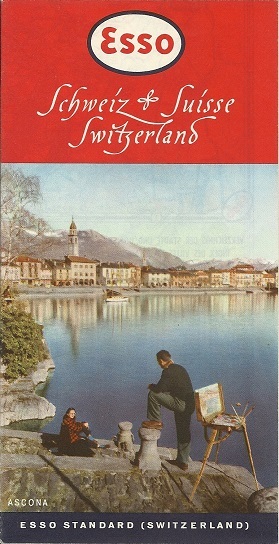 The rear covers varied, but used fewer designs; 1957 and 1958 were closely matched to their respective front cover styles. Four Swiss maps from (L-R) 1950, 1953, 1955, 1956 and 1959. The older two maps are of a smaller format (the same size, in fact, as the Belgian maps above) and are at the slightly smaller scale of 1:500,000 - the others are all at 1:460,000. The later maps lack topographic hill shading on the earlier ones. All five maps were drawn by the large Swiss cartographic company Kümmerley & Frey. 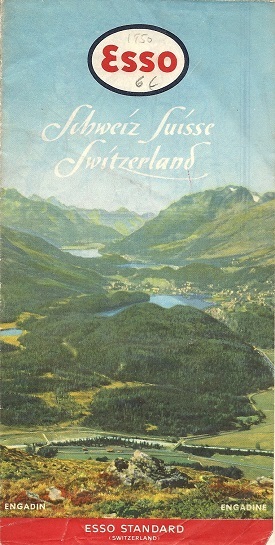 The locations are given as Engadine, Ascona, Bern, an unidentified view and the Grimsel pass. The next three pages focus in turn on maps from Great Britain, Germany and Italy.